Click here to view part 2 of this article. This two-part article, originally published in Sensors Magazine, describes engineering considerations for specifying thermal environments to optimize production throughput of temperature-compensated sensors and transmitters. Part I covers chamber configurations, while Part 2 will address thermal environment performance related to heat transfer, uniformity, and controls. Ensuring the measurement quality of devices especially industrial sensors, over their specified operating range typically requires thermal testing at different stages of the production cycle. Engineering must look not only at device size and test specifications, but also to consider test access, and operations’ need to conserve floor space and maximize flexibility. Achieving quality goals involves many points of thermal stress including conditioning, verification, calibration, life testing, design qualification, failure analysis, quality checks, and regulatory audits. Production throughput is an increasing challenge as industrial applications call for higher operating temperatures. Figure 1. Many industrial sensors need to operate at 200°C and above for long periods of time. All manufacturing processes are subject to many interrelated variables. The test environment is no different and, as such, we will discuss the above points throughout the article, rather than in sequence. Most process measurement devices (flow, pressure, level, etc.) have at least one thing in common – the need for temperature compensation. As the physical size, thermal mass, and need for stimulation increases with each assembly step, the test environment must also grow. Typically, no single environment can effectively do it all. For example, a small chamber containing low mass PCBs provides a more efficient enclosure than an oversized volume of space. Alternatively, subassemblies may need more thermal capacity and volume to meet reliability testing. Moreover, the space available in a lab or manufacturing floor offers other challenges to proper chamber sizing. Variables that can affect chamber size and configuration are illustrated in Figure 2. Figure 2. Four main factors influence the optimal test environment. Configuring a controlled temperature environment depends on how you manage four primary areas: test requirements, devices being tested, throughput, and facility infrastructure. Your device (circuit, sensor, assembled housing) size, mass, and number of UUTs (Units Under Test) will factor into determining enclosure size. However, the amount of real estate needed on the plant floor for different phases of production is not necessarily fixed. Thoughtful consideration of configuration options can improve productivity and economize on floor space. 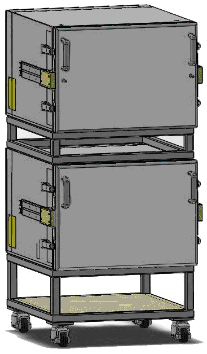 Three examples of thermal enclosures configured to optimize throughput are shown below. For devices sensitive to thermal shock, enclosure designs can disperse air around the circuits to prevent direct exposure to the temperature source, as shown in Figure 3 right. Figure 3. A portable, air-driven, temperature inducing system targets UUT directly (left) or indirectly at sides of enclosure (right). 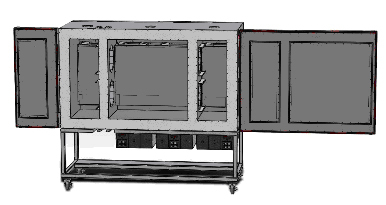 With the build out of devices – applying transducers and housings – larger thermal enclosures are often required. Large chambers consume a lot of floor space, which typically comes at a premium. Stacking of single-zone chambers with independent controls, as shown in Figure 4, is a way to double use of floor space per a given area. Figure 4. Stacking thermal chambers doubles available floor space. Finished sensor and transmitter products have different areas of temperature sensitivity. The sensing electronics, for example, may not exceed 85°C, while the seals of a pressure transmitter may need to be tested at 125°C. Multiple zones (2, 3, 4 or more) provide separately controlled temperature environments. It permits simultaneous testing of devices at different temperatures. A 3-zone chamber, shown in Figure 5, is an example where the center zone simulates high heat conditions of pipeline flow. The outer zones can be programmed to meet operating temperature extremes of the instrumented electronics. Figure 5. 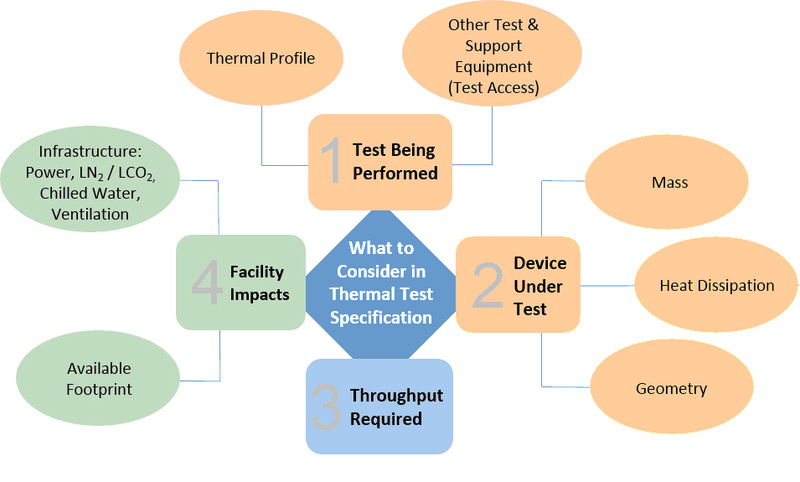 Multiple zones allow simultaneous device testing at different temperatures. Plan for user access and how it affects production. Various test setups need different amounts of user involvement and real estate. Consider what physical and visual access to UUTs suit your test needs and available floor space. 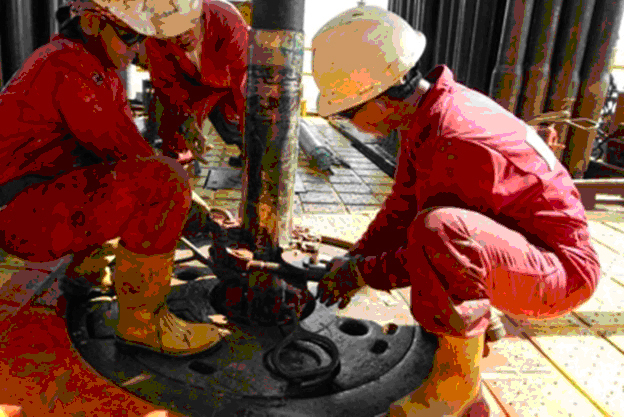 What do operators need to effectively and safely set up tests? For example, it may be more convenient to attach cables or measurement connections to the UUT outside of the chamber where there is more room to work. That way loading and unloading of devices is faster. Adding notches (Figure 7) to the chamber, in place of or in addition to ports, provides this capability. During transmitter calibration a different configuration may be needed. For example, an operator gains access to a pressure source at one side of the chamber, but normal loading of devices may be from another side. Multi-door configurations can optimize user convenience and test productivity. What about visibility? Windows and lights provide visual access to the UUT. Do you need to economize on floor space in the production or reliability test lab? Chamber stacking and casters are a few ways to increase use of space, as well as flexibility to configure how floor space is used. Figure 6 illustrates these configurations. Figure 6. Combination hinged and removable door (left). Multiple hinged doors – opposing or adjacent sides (right). There are many considerations for optimizing throughput from a chamber configuration standpoint, (see Figure 7). Users need to make physical connections, load and unload devices, and perform these tasks within the confines of available floor space. Figure 7. 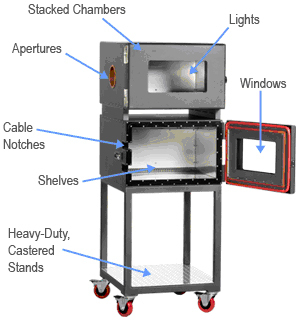 Partial summary of thermal chamber configurations – physical and visual access (notches, ports, shelves, windows, lights), stacked chambers, and mobility. The above points are meant to help understand how different configurations can work to your advantage. The business goals will determine tradeoffs between value of increased production and degree of equipment specialization required. In part two of this article, we'll look at how cooling capacity and temperature control methods affect heat transfer performance, accuracy and uniformity.